Keeps getting better and better! 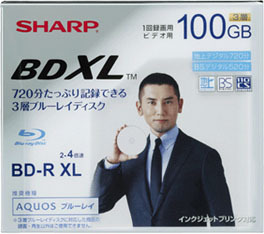 Sharp today announced a Blu-ray disc that can store up to 100GB. Thats a lot of data! It also meets the BDXL specifications – which is a format to support 100GB and 125GB disks. The disc is called VR-100BR1 which is a triple-layer single-write Blu-ray disc. The disc can be written only once and rewrites are not possible. Blu-ray discs as of today can store up to 50GB of data and this latest disc from Sharp doubles the capacity and lets you record 12 hours of high def video! The new discs are also specially made to be protected against scratches and dirt. The new discs have a hard coat protective coating. Sharp has been in the forefront of developing the disk and pushing it into production. Sony has been working on an eight-layer 200GB disc but has not been anywhere close to production. Many other companies are working on high capacity discs and now with Sharp starting production we should see much needed progress in this sector. Sharp did not set any price but rumors suggest the price to be about $60 a disk and could go lower as companies compete. No world release dates were given but the disc will be available in Japan from July 30th. Hopefully we will have more than one movie stored on a disk without having to go through the pain of flipping discs into the Blu-ray player. Previous iPad in nine more countries coming this Friday!